Pick of the Week: 20% Off Audible Time Timers! Setting a routine can be a challenge — a visual timer can make all the difference when executing day to day activities and getting back in the groove! 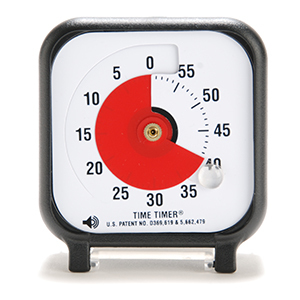 Ideal for timed activities or getting ready, our favorite Time Timers are perfect for individual use or classroom settings. Recommended by Autism and ADHD experts, the Time Timer is entirely intuitive to use. A graphic clock face gives the child a visual understanding of time elapsing. When the colored portion of the clock face elapses, time is up! There is also an optional audible component that you can turn on so that the timer beeps when time is up. It runs on battery-operated quartz movement and can be free standing or hung on a wall. This week only, you can save 20% on your purchase of the 3-inch, 8-inch, and/or 12-inch Audible Time Timers by entering the Promo Code TIMER20 at checkout! Written by: Different Roads to Learning on October 5, 2016. This entry was posted in Pick of the Week and tagged audible time timers by Different Roads to Learning. Bookmark the permalink.